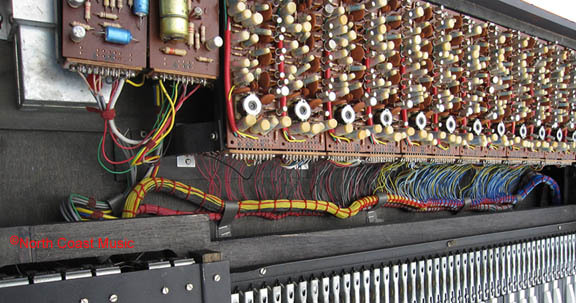 The distribution wiring harness interconnects the power supply, tone generators, key contacts, drawbars, preamp, and vibrato circuits in the V301E Continental Organ. This neatly wrapped bundle of cables was hand wired and soldered to the PC socket and key contact connectors and then stapled to the bottom of the organ. Each of the twelve tone generator has ten connections, each of the forty nine key contacts has ten (the IV rank key contact has four itself). Just these two subassembles involve over 600 solder joints. As the distribution wiring harness was assembled inside the organ case and wraps around several non removable cabinet supports, removing the wiring harness to facilitate recovering the vinyl on a V301E Continental is a near impossibility. From a practical standpoint, you cant take it apart, there are far too many wires to unsolder.